At the Peace Resource Center, we participate in and host many events related to Peace and Social Justice throughout the year. Check our Facebook page and Calendar for current dates and times. Saturday, 9/15 – Sunday, 9/23: Peace Week San Diego 2018, at various locations. The PRC invites you to join Campaign NonViolence Week this September, San Diego style! Event kick-off with Overpass Light Brigade shining peace over San Diego on Saturday, 9/15, and a musical gathering to kick off the week at Mission Bay. Event finale – We join the long-standing peace vigil downtown Vista on Sunday, 9/23.”Peace Week San Diego 2018 expands on our War Is A Lie series by providing present day peace alternatives to replace the war economy. Forums and workshops include Towards Creating a Peace Economy in San Diego; Personal Divestment from the War Economy & Redirection; a peace light show over San Diego with Overpass Light Brigade and a community gathering, #Abolish the Police? Then What?, a Movie Night with the OB Green Center and Resiliency Circles for activists and neighborhoods impacted by militarized law enforcement as well as a Grow Your Own Food workshop.The PRC joins with other peace groups to celebrate and promote peaceful alternatives. This year, the goal is to provide some capacity to increase networking amongst new and established groups to enable us to create local peace infrastructure, from urban food production to self-care to divestment and investment. Click here for dates and locations of Peace Week actions and gatherings. Sunday, 11/18: The 2018 Annual Gathering of the membership of the Peace Resource Center, at the Church of the Brethren. 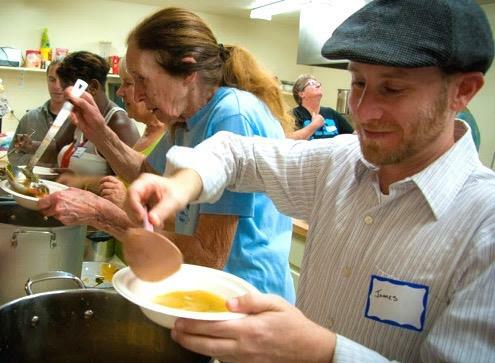 Everyone is invited to join us for the Souper Supper – delicious vegetarian & vegan soups, cornbread & apple juice. Only members can participate in the Board of Directors selection, so please remember to renew your PRC membership by Nov 15, 2017!! Soup servers 2016 Annual Souper Supper! 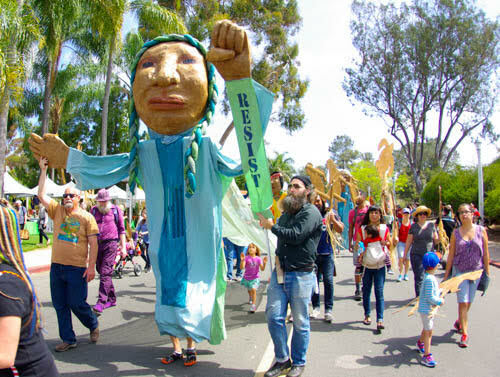 PRC is recognized by Pride 2017 for its giant puppet, Earth Mother, uniting allies in justice. Big heartfelt thanks to the San Diego Puppet Insurgency and People Over Profits San Diego..
August 6th & 9th are the anniversaries of the bombings of Hiroshima and Nagasaki in 1945. Since 2006, United for Peace & Justice has declared August as Nuclear-Free Future Month regarding nuclear power and weapons (www.nuclearfreefuture.org). Each year, we recall the history and find some way of connecting with the public around peace and nuclear issues. Events have ranged from hosting film discussions and guest speakers to sharing the story of Sadako and folding peace crane origami. Current Exhibit on Display at the PRC – a series of historical documents commenting on the bombing of Hiroshima by the US. Curated by Dr. Jeoffrey Gordon. This is another day that we enjoy recognizing and promoting to the public. It was established by the United Nations in 1981. Then in 2001, it was updated to occur on September 21st each year and to “be observed as a day of global ceasefire and nonviolence, an invitation to all nations and people to honor a cessation of hostilities for the duration of the Day” (www.un.org/en/events/peaceday).